Immaculate, spectacular views of downtown Reno & mountains from this 3 bedroom, 2&1/2 bath Northwest Reno home. 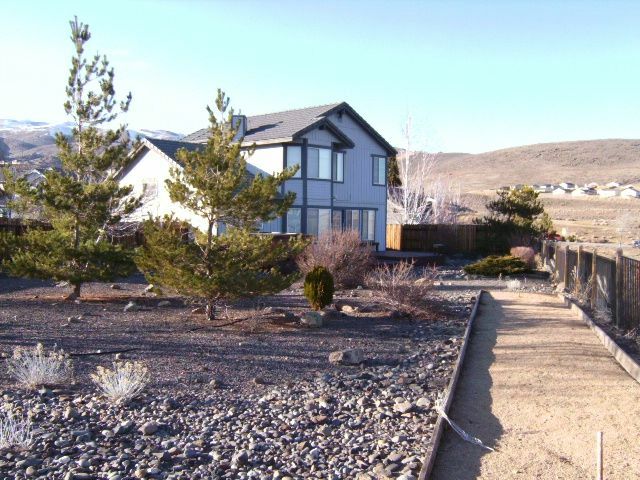 Seven minute drive to downtown Reno Strip. Check out the brand new outdoor space with fire pit & outdoor kitchen. Grill and chill on the huge deck with awesome views of the city lights. Bright, open & airy floor plan with gorgeous hardwood floors downstairs & gas fireplace. Aboslutely awesome remodeled kitchen. Huge master bedroom with king bed & million dollar views of city lights. Kick back & relax in the garden tub in the large master bath. Almost a half acre with horseshoe pit & huge redwood deck. You’ll feel like you are on top of the world as you enjoy the peace & quiet with no rear neighbors. Cul-de-sac location. Wireless internet access through out for your laptop. Hot tub on deck is not for guest use and is not included in rental. Monthly rental available. Reno-Tahoe is home to many fabulous events including Reno Rodeo, Hot August Nights, Great Reno Balloon Races, Reno Air Races & many more. Daily activities include casino gambling & nightly shows. Reno is just a short drive to Lake Tahoe which boasts world class snow skiing in the winter & water activities in summer. Check out all the 5 star reviews. Guests love this home!! This home is a 'home away from home.' The home is fully furnished & perfect for multiple month rental. Fire pit is operational subject to weather conditions. Please note fire pit is operational during winter months subject to weather conditions and will not be operational in inclement weather. Guests use fire pit at their own risk and agree not to remove the fire pit cover. Hot tub on deck is not for guest use and is not included in rental. No event parties or house parties allowed. I lived in Nevada for 30 years & loved it!! I have owned this home since it was built. It is a spectacular home with million dollar views and located in a 24 hour town with numerous events. Reno is a small town & easy to navigate. It is a very dry climate with a distinct change of seasons that we all love. There are water sports in the summer & snow skiing in the winter. Lake Tahoe is sometimes called the 8th wonder of the world & is just a short drive. Check out this property. Where can you get mind blowing views of the city lights, outdoor fire pit, grill area, plus beautiful & immaculate 3 bedroom home? This home is comparable to staying at a high end resort. One Side of Garage Available Only. Owner stores car on the other side. Only one side of two car garage is available for parking except for Hot August Nights. Hot tub on deck is not included for guest use. The house was very nice and spacious. Our family had a great time on our vacation to Reno. The house was perfect because it had enough room for all 6 of us. The views from the back of the house were great. We stayed for a baseball tournament in Sparks and this was the perfect location. Plenty of space to stretch out and a backyard with a view to die for. Great location! We would stay here again. Up on a hill gave us great views and just down the hill were restaurants, a Safeway and a big Walmart. Glad you enjoyed your stay!!! Really enjoyed our time staying at this wonderful home. Great experience! The house was really nice. This home was the perfect getaway for my family. Two adult couples shared the three bedroom, two and a half bath home comfortably. The kitchen is fully stocked and perfect for dual cooks. The living room was comfortable and cozy as well. The best part was the outdoor space!!! We sat around the fire pit each night and watched downtown Reno come alive with all the sparkle and glitz it possesses. This home would be ideal for couples , families or a friends' getaway. It's in a beautiful neighborhood and close to downtown and the airport. The owner thought of everything to make the stay easy and comfortable. I'd highly recommend this home!!!!! I am very happy that you enjoyed the home. Thank you so much for your stay and the great review!! Reno-Tahoe is home to many fabulous events thorough out the year including Reno Rodeo, Hot August Nights, Great Reno Balloon Races, Reno Air Races & many more. Reno is just a short drive from Lake Tahoe which boasts world class snow skiing in the winter & water activities in the summer. No Pets, No Smoking, No House Parties -All reservations include only one side of garage for parking. Use of fire pit is subject to weather conditions. Fire pit will not be operational from December 15th to February 28th or in inclement weather. Guests use fire pit at their own risk and agree not to remove the fire pit cover. Hot tub on deck is not for guest use and is not included in rental. A $250 refundable security deposit is required prior to occupancy- this is a hold on your credit card, not a charge, and assuming there is no damage it is release with-in a few days of check-out.. Cancellations: must be submitted in writing prior to the reservation date. Cancellations at least 90 days out will receive a full refund less $200 cancellation fee. For cancellations less than 90 days out every effort is made to rebook the home. If and when the home is re-booked and new monies confirmed, your monies will be refunded LESS the following: $200.00 cancellation fee and credit card convenience fee.